The events described in one Sthala Purana are linked to those mentioned in another. Thus the strand of the same story is taken through a number of Puranas. We have to read them together to learn the entire story. That one Sthala Purana begins where another ends is one proof of their authenticity. Another proof that could be adduced is that it is these Sthala Puranas that fill the gaps in the 18 main Puranas and Upa-puranas. Once Siva and Amba(Parvati) played dice in Kailasa. "I have won the game, " said Amba. "No, I am the winner, " said Siva. The two played thus to impart lessons in dharma to mankind. If now their game of dice ended in a quarrel it was because the divine couple wanted the world to learn that playing for stakes was an evil, that it leads to disputes and misconduct. To resume the story. In his anger Siva cursed Amba thus: "You shall be born a cow and shall keep roaming the earth. " Siva is Pasupati, lord of animals. Yes, he is the Lord that controls the animal senses(the indriyas) that are in a frenzy. It is to demonstrate that he does not bless people with a big ego that he cursed even Parasakti(the Supreme Power). Though she is Mahasakti herself she realised her error and, the great pativrata that she is, she became submissive to her husband. She roamed the earth as an ordinary cow. In her One Thousand Names ("Sahasranama") Amba is extolled as "Gomata, Guhajanmabhu. " She came to the earth as Gomata(Mother Cow). Tiru-Azhundur is the place to which sister and brother came as cow and cowherd. It is the same as "Terazhundur". It also happens to be the birthplace of Kambar and in fact there is a locality here called "Kambarmedu". Tirumangai Azhvar performed the "mangala sasanam" in a temple here. Visnu is in the sanctum sanctorum as Gopala with the cow. Since he came as a companion of the cow he is called "Gosakha". "Gosakhaksetra" is another name for Terazhundur. "Gosakha" in Tamil is "Amaruviyappan", the initial "a" in the name meaning cow. There is a temple to Siva also here. According to our ancient system of town-planning there must be a temple to Siva at one end of a village or town and one to Visnu at the other. If the Visnu temple at Terazhundur is associated with the songs of the Azhvars the Siva temple is associated with the Tevaram hymns of Jnanasambandhar. The places sung by the Azvars are said to have had "mangalasasanam", while any place associated with the Tevaram is called "patal perra sthalam" [place that has been sung]. Many places in the South have had both types of distinction. Terazhundur is one of them. Near it is a village called Pillur where Visnu, as the cowherd grazed the cow that was Amba. ("Pillur" means a place where grass grows, pil meaning grass. In the Tanjavur region pul is known as pil. ) Mekkirimangalam also is one of the places where Visnu grazed the cow and An-angur another(an=cow). The cow as well as the Brahmin is essential to the practice of Vedic dharma. Milk and ghee are indispensable to sacrifices, while without the Brahmin the sacrifices cannot be performed. This fact is underlined in the prayer, "Gobrahmanebhyo subhamastu nityam" [May cow and Brahmin ever prosper]. The one (that is Siva) who had cast a curse on Amba came as Vedapurisvara to the same place where Amba had also come. Until recently there were many Brahmins in this place learned in the Vedas and sastras. Sambandhar often refers to them as "Azhundai Maraiyor"(Vedic scholars of Azhundur). The Azhvars call Visnu by these names: "Chandoga", "Pauzhiya", "Taittiriya", "Samavediyane". One day, when the cow (that is Amba) was grazing, her hoof dug into the earth and a stone was revealed. It proved to be a Siva linga. The cow, thinking that she had commited an offence against Siva, ran about in bewilderment. Visnu pacified her and brought her back. The place where this incident occured is "Tirukkulambiyam". Visnu was pained by all these developments and regretted that his sister had shown herself to be egoistic, albeit playfully, and that this fact had led to such unfortunate consequences. It was Visnu who had married Minaksi to Sundaresvara. Wishing to unite them again he now performed puja to propitiate Siva. The latter was pleased and he said to Visnu: "Keep grazing the cow until you come to the river Kaveri. Bathe her in the river and she will be restored to her original form. I shall tell you later when I will marry her. " Amba was restored to her original form and Siva himself appeared on the scene. But he wanted to play a game again. There is a place called Kurralam. (It is not the same as the Kurralam in Tirunelveli district that is famous for its waterfall. This Kurralam is near Mayuram in Tanjavur district. It was once called Tirutturutti. This is one of the 44 places which Appar, Sambandhar and Sundaramurti have sung. ) A sage was performing austerities here for Amba herself to be born as his daughter. Siva thought that this was the opportune moment to grant his wish. He said to Amba: "Go and be born the daughter of the sage at Tirutturutti. I will come and marry you at the appropriate time. " Siva made his appearance as promised. There is proof for the fact that the one who gave his word at Gosakhaksetra appeared here also in that in this place too the deity is called Vedesvara. The sage and Visnu- the latter had been waiting for the day his sister would be married again to Siva- received Siva and took him to the place of marriage. The spot where Siva was received came to be called "Etirkolpadi". The "vrata" before the marriage was performed by Siva in a nearby place which later came to be called "Velvikkudi". The spot where he saw Amba as the bride and performed the palika ceremony is called "Kurumulaippali". The marriage pandal was spread over two or three villages. The one in the middle came to be called "Tirumananjeri ". It was here that Visnu married Parvati to Paramesvara and it was an occasion of great joy for him. From this account you will realise how wrong it is to dismiss Sthala Puranas as of no significance. The present story contains a warning against the evil consequences of ahamkara and gambling and tells us how a wife should be dutiful towards her husband and how a brother should be affectionate towards, and concerned about, his sister. Actually I did not tell the story with this idea in mind. I wished to demonstrate how a number of Sthala Puranas fit into one another, how the incidents narrated in different Sthala Puranas are woven together- those of Terazhundur, Pillur, Anangur, Tirukkulambiyam, Tiruvaduturai, Kurralam, Etirkolpadi, Velvikkudi, Kurmulaippali and Tirumananjeri. The interconnected narrative also shows that the story must be authentic. A story with which people of Tanjavur should be more familiar links Kumbakonam with places in its neighbourhood. During the great deluge Brahma prepared himself for the next creation. He put all the seeds in amrta(the elixer of immortality) and kept them together in a mudpot to the chanting of Vedic mantras. With due ceremony, he placed a coconut with mango leaves on it and invested the same with the sacred thread. Now he placed the pot on the summit of Meru. When it came floating in the waters of the deluge, Paramesvara wished to recommence creation. Then the coconut on the pot was dislodged in the storm and fell into the water. At once the water receded revealing the land there. This spot is four miles north-west of Kumbhakonam. The deity here is even today called "Narikelesvara", ("narikela" means coconut). Then the mango leaves fell off. The water receded there too revealing land. This is Tiruppurambayam, four miles north-west of Kumbhakonam. "Payam" [or bayam] is "payas", that is water, but in this context deluge. "Puram" means outside or beyond something: the name of the place [Tiruppurambayam] thus means"outside the waters of the deluge". Now the sacred thread(sutra) also got loosened from the pot and fell off. The deity in the place where the sutra fell is "Sutranatha", "sutra" meaning the "sacred thread". The kumbha(pot) had a "nose" in addition to a "mouth"- it was like a gindi or kamandalu. My pot too has a nose in addition to its mouth. Water is filled in the pot through the mouth and poured out through the nose. The pot with the amrta was also similiar. Paramesvara watched the scene. Since the pot with the elixer and the seeds in it were not overturned on their own, he decided to break it with his arrow so as to bring out its contents. The place where he discharged the arrow is called "Banapuri"- now it is known as "Vanatturai". The deity here is "Banapurisvara" and the spot where the mouth of the pot fell in pieces is "Kudavayil"("Kudavasal"). Paramesvara wanted the amrta to be discharged in the sastric manner, from the nose of the pot. The place where the nose broke and the elixir or ambrosia fell is holier than other places. It is called "Kumbhakonam", "kon"("konam") meaning nose. In the Tevaram the place is referred to as "Kudamukku". Here the mudpot itself came to be the linga and even today it is so. The linga is ceremonially bathed along with a protective wear outside. "Kumbhesvara" is the name of the deity. The Mahamagham pond is the spot where the amrta first fell. Since the place is hallowed by the fact that it was here that the amrta fell, the Vaisnava deity here, Sarngapani, is called "Ara-amudan" by the Azhvars. To Vaisnavas Kumbhakonam itself is "Kudandai". Thus there are many sacred places that are interconnected, which fact also confirms that the Sthala Puranas are authentic. Tiruvazhundur, Kumbhakonam, etc, are situated within a radius of four miles. There will be further confirmation of the authenticity of these Puranas if we note how the places mentioned in them and which are far apart are connected together. Ramesvaram, Vedaranyam and Pattisvaram are not near one another. Ramesvaram, in Ramanathapuram district, is on the seacoast. Vedaranyam is in a corner of Tanjavur district and is also on the seashore in the taluqa of Tirutturaipundi. In the same district, but by no means close by, is Pattisvaram which is near Kumbhakonam. These places which are far apart are connected by the same thread of a story. Would you call such a story baseless? In all these three places there are great Siva temples and the name of the deity in each is "Ramalinga", suggesting that they are connected with Rama. That he installed lingas in these places strengthens the concept of Saiva-Vaisnava unity. These places have some other special features too. Of the four great religious centres, known as "car-dham", Ramesvaram alone is in the South. In the North is Badrinath(a), in the west Somanath(a), in the east (Puri)Jagannath(a) and, of course, Ramesvaram in the south. Vedaranyam is associated with the salt sathyagraha during the freedom movement. The place is mentioned in the Tevaram as "Tirumaraikka"(Tamil for Vedaranyam). Here the temple door was closed after the Vedas had worshipped the deity Siva. Appar sang his patigam here and the door flung open. Tirujnanasambandhar made the door shut again when he sang before the deity. Pattisvaram is the place where Siva was worshipped by Patti, one of the four daughters of Kamadhenu. Like Tiruvaduturai mentioned before there are many places where the cow has performed worship. Tiru-Amattur is near Panrutti. It is connected with Appar. Here too the cow has performed puja. Pattisvaram is a similiar place. When Jnanasambandhar was a child he sang the praises of Siva and went dancing before the deity in the hot sun. The Lord was moved by the sight and ordered his attendants to build a pandal to protect his devotee from the sun. Jnanasambandhar was an incarnation of Subrahmanya. Govinda Dikshita was a minister to the Nayaka kings of Tanjavur. He was very much drawn to Pattisvaram and made additions to the temple there. Images of Dikshita and his wife may be seen before the sanctum of Amba. Where did Agastya witness the marriage of Siva and Parvati? Three places are mentioned, that is three places are associated with the same event. As mentioned before, the Ramalinga was installed in three places, but in each place a different reason. Rama commited a threefold sin by slaying Ravana. Ravana, the son of the sage Visravas, was a Brahmin. By killing him Rama incurred the sin of "Brahmahatya". To wipe away the same he installed the linga at Ramesvaram. Some people today describe the war between Rama and Ravana as a quarrel between Aryans and Dravidians. Such a view is totally baseless and there is no better proof of this than the fact that Ravana was a Brahmin. If the Ramayana is a lie so must be the battle between Rama and Ravana. It cannot be claimed that there is a historical basis for this battle alone. If the Ramayana is accepted as true the account of Ravana contained in it must also be taken to be so. It is said again and again in the epic that Ravana was the son of a sage, that he was conversant with the Vedas, that he pleased Siva by chanting the Samaveda and that it was for this reason that he was saved from being crushed under Kailasa. It does not stand to reason to accept only that part of the Ramayana which suits you and reject the rest. Leave aside the Ramayana and what it says about Ravana: the temple of Ramesvaram is there for all of us to see. It has the biggest corridor in the world ("prakara", ambulatory). All India worships Ramanathasvamin in the form of the linga Rama installed for the removal of the sin he had incurred by killing the Brahmin Ravana. For centuries our forefathers in Tamil Nadu never thought of Ravana as belonging to a caste other than that of Brahmins. Apart from being a Brahmin, Ravana was also a great warrior. All the worlds trembled before him. He fought successfully all the powerful rulers of the time except two- Kartaviryarjuna and Vali. By killing such a warrior Rama committed the sin of"virahatya". It was in expiaation of it that he installed the linga(Ramalinga) at Vedaranyam. In addition to the qualifications already mentioned, Ravana had another; he was an ardent devotee of Siva and proficient in playing the vina, besides being a singer. Excellence such as this comes under the term "chaya": it means both light and shadow. The goddess Minaksi is addressed as "Marakatachaya" (emeraldine in radiance). By killing Ravana who possessed chaya, Rama also earned the sin of "chayahatya". To expiate it he installed the linga at Pattisvaram. From the sastric point of view, by slaying Ravana Rama brought on himself the threefold sin of Brahmahatya, virahatya and chayahatya. Actually Rama is patita-pavana and he cannot be tainted by any sin. By uttering His name a man is freed from the most terrible of sins. So Rama has no need to perform any prayascitta (he does not have to do any expiatory rite)- he is "Taraka Rama ". But he had descended to this world to serve as an ideal for all mankind and so he acted strictly according to the canons even with reference to matters that might be considered trivial. 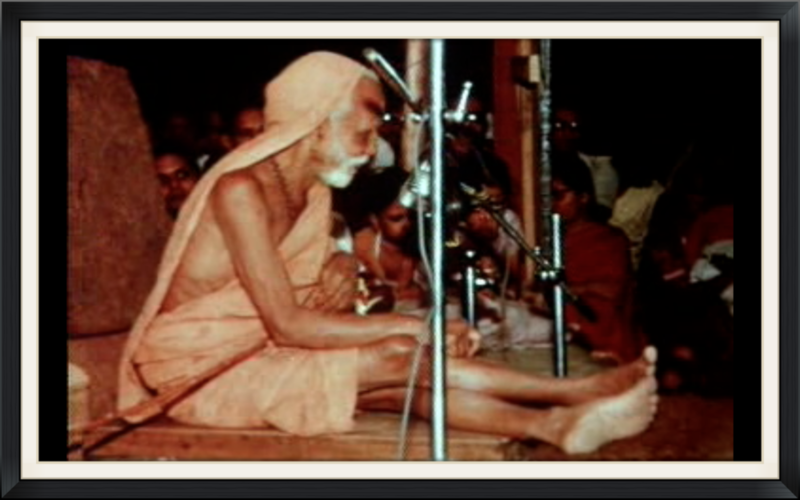 In the observance of dharma according to the sastras no one excelled Him. Throughout the Ramayana we see this remarkable trait in His character. He regarded himself as an ordinary individual, observed all the rules of the sastras; in this way he also performed the prayascitta according to them. This is not mentioned in the Ramayana of Valmiki; but the Sthala Puranas of Ramesvaram, Vedaranyam and Pattisvaram fill the gap. "The Ramayana does not contain these incidents. They must some old wives'tales. " To think so is not correct. The incidents described in the Sthala Puranas are in keeping with Rama's character. He must have performed the three types of penitence. What is left out in the Ramayana of Valmiki is mentioned in the Sthala Puranas. Ravana had caused suffering to all mankind and it was with an evil intent that he had stolen Sita, the mother of the world. Rama killed such a wicked character amd made all the world happy. At a time when there was a universal rejoicing over his victory, Rama thought himself to be a sinner because he had killed an enemy eminent in three different ways. The loftiness of His character is further enhanced by these acts. That he installed the linga in three different centres goes to demonstrate the unity of Hari and Hara (Visnu and Siva). These Sthala Puranas do not contradict one another nor is there any overlapping in them. Those pertaining to Ramesvaram, Vedaranyam and Pattisvaram deal respectively with how Rama, by installing the linga in each place, was freed from the sins of Brahmahatya, virahatya and chayahatya. Rama must have proceeded north from Ramesvaram along the coast. From Vedaranyam he must have gone to Pattisvaram in the interior. It is the strand of the same story that takes us through three Sthala Puranas. The three places are 150 or 100 miles apart from one another. When there were no fast modes of transport these distances correspond to 1, 500 or 1, 000 miles today. The fact that the stories belonging to the three places fit into one another shows that the Sthala Puranas relating to them must be true. I would like to express a view that might seem strange to modern researchers and traditional scholars alike. It is generally believed that the Sthala Puranas cannot be considered authoritative to the same extent as the Ramayana. But I think that such of them as are authentic are more authoritative than the Ramayana, the Mahabharata, the Visnu Purana and Bhagavata Purana, and so on. I have come to this conclusion from examples like the one I have cited above. Now I am going to speak about Sthala Puranas that connect places in different parts of the country. There are two versions of the Kaveri Purana. One gives importance to the Amma mandapa on the Kaveri in Srirangam. It states that bathing in the Kaveri in the month of Tula(October-November) is specially meritorious. The chief character in this Purana is the Cola king Dharmavarman. He reigned from Niculapuri. The Sanskrit words "nicula", "nicola", "coli" mean a garment covering the body [or a part thereof] like a case ("urai" in Tamil). The place called "Uraiyur" is known in Sanskrit as "Niculapuri". The kingdom with its capital as Niculapuri came to be called Coladesa (Cozhadesa). What is remarkable about a corn-cob? The grains growing on the top of the stalk are encased in the "cob". It means the grains of the cereal called colam or maize wear a coli so to speak. In the second version of the Kaveri Purana the bathing ghat called Tula-ghattam in Mayavaram [Mayuram] is given importance. It is popularly called "Lagadam": the word must be a distortion of "Tula-ghattam". This ghat has been specially built for the convenience of pilgrims who bathe in the Kaveri in the month of Tula. There are such ghats in six or seven other places on the Kaveri, all built to the same plan. While in the first version of the Kaveri Purana Srirangam and Dharmavarman figure as important, in the second, apart from Mayavaram, a Brahmin couple find a prominent place. The couple were liberated by bathing at this ghat. The Brahmin was called Nathasarman and his wife Anavadya. They were freed from wordly existence by bathing day after day in the Kaveri in the month of Tula in the manner prescribed by the sastras. The Brahmin couple had during their pilgrimage visited Kedara and Kasi. (This story is known only in Mayaram. ) Kasi is a thousand miles from here. One of the ghats there is called "Kedarghat". The Sthala Purana of Kedarghat mentions that the Brahmin couple, Nathasarman and his wife Anavadya, bathed there. People in our parts are not much familiar with the story of Nathasarman. He is not like Rama, Krsna, Hariscandra, Nala and so on to be known all over the land. It is amazing that the story of such a man as told in the Sthala Puranas of Mayavaram and of Kasi, a thousand miles away, tally. This story shows how wrong it is to be sceptical about the authenticity of Sthala Puranas. Kasi, which is a thousand miles from Kancipuram, is famous for the goddess Annapurni. In Kanci too, when the World Mother observed the 32 dharmas, she distributed food among people. Opposite the doorway of the sanctum of the Kamaksi temple in Kanci is the sanctum of Annapurnesvari. It has a vimana or tower that is unlike that of any other temple in the South. It has six spires ("sikharas"). The explanation for this is the fact that the tower of the Annapurnesvari temple in Kasi too is similar. Even in such small matters there is agreement about places as far apart as Kanci and Kasi. Are Sthala Puranas then to be dismissed as of no consequence?